Can you tell us more about your role and what you do on a daily basis? I’m a security officer at Conrad Centennial Singapore. My daily responsibilities include issuing visitor passes, monitoring the entry and exit of visitors, lobby duties and keeping track of key movements. Should there be any incidents, I can review the CCTV footage to help out with the investigation. Apart from that, the security team also maintains the hotel’s fire command centre and oversees the room door security system. How do you think you contribute to a guest’s happiness during their stay? To be frank, I don’t really interact with guests that much. I only speak to them if there is an incident to attend to. But from the brief interactions I have with them, I make sure I give my best and help them out in any way I can. Even if I can’t help them with a particular request, I’ll make it a point to find the right person who can help them. How long have you been in the security and hotel industry? I have been working in security for 14 years. I joined the auxiliary police right after I graduated from polytechnic, where I got my diploma in Police & Security Studies. I’ve only been in the hotel industry for five months. This is my first experience joining this industry, and it’s been an eye-opening experience. I was a bit apprehensive initially because I don’t have much experience facing guests and customers. I wasn’t sure if I had the right skills to work in the hotel’s security team where things are more service-centric. But I’m learning every day and I really enjoy my job now. What inspired you to join the hotel industry? After working in the security industry for 14 years, I realised that my schedule was always very tight. It was manageable when I first joined the industry because I was not married then. However, things became more challenging after I got married and had children. There were days when the working hours were so long that I didn’t get to see my children. Hence, I wanted a change of environment. When I started working in a hotel, I realised that it was a whole new world. The hours are more manageable. I can now spend more time with my children, keep track of their progress and even bring them out to have some fun once in a while. What do you like about working at Conrad Centennial? I really like the work environment. Here, I can be a security officer and still smile. I don’t have to be stern all the time. Working at a hotel has taught me how to be more friendly and approachable while carrying out my duties. I also have very good colleagues whom I’ve gotten to know during my time here. They’re not just from the security department – but also in housekeeping, engineering and those who are based at the lobby. I’ve learned a lot about the hotel industry from them, and it’s interesting to find out how each department works and how we can help each other out. It feels like I have a family here. My colleagues will talk to me and ask me about my well-being. And if I don’t come to work for a while, they’ll ask if I’m okay. We’re genuinely concerned about each other and we look out for one another. But I suppose my favourite part of the job are the perks that come with working in the hotel industry. What are some of the job perks that you enjoy? The hotel really takes care of its staff. We’re provided with really nice meals, and our uniforms are even washed and ironed for us. This inspires me to work even harder as a way of giving back. But to me, the greatest perk of working in a hotel is that I am able to spend more time with my family, since the work hours are more manageable. Is there anything new that you’ve learned since joining the hotel industry? 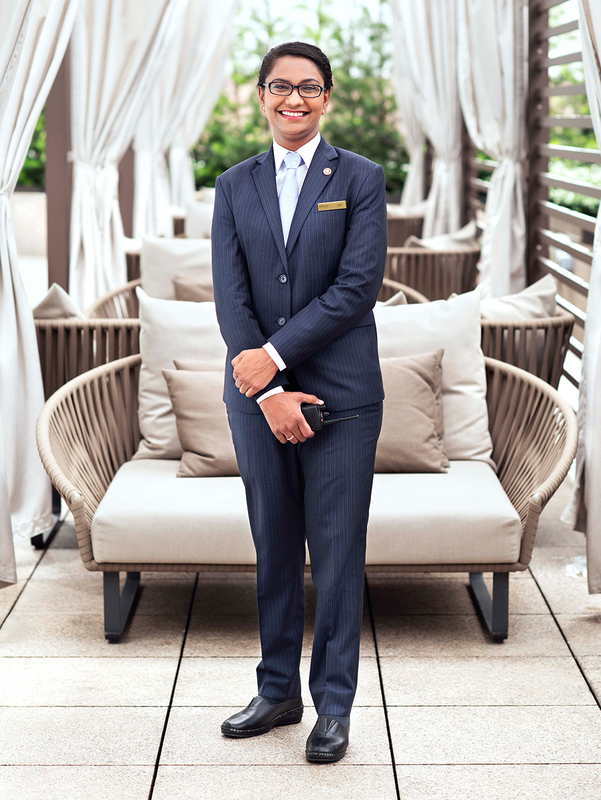 I used to be rather short-tempered; it was one of my biggest concerns before joining the hotel industry. When you’re working in a hotel, you have to be polite and you can’t get angry easily. So I had to learn how to balance being firm yet courteous and professional at the same time. I’ve also learned how to handle different incidents, and how to write reports. But I still have much more to learn, and I want to grow as much as I can during my time here. Do you enjoy having more people interaction while on the job? Yes, and not just with the guests. I enjoy interacting with my colleagues as well. It’s important for my colleagues and I to get to know each other so that we can communicate better. Should an incident or emergency happen, the security team has to liaise with our colleagues in other departments. So it’s important for us to build that relationship. What advice would you share with someone who is interested in joining the hotel industry? I’d encourage them to join the hotel industry because it really changes your impression of what security means. There’s also much to learn. You can try different things, grow your knowledge, and of course – enjoy the perks of the industry.